Figure 1. 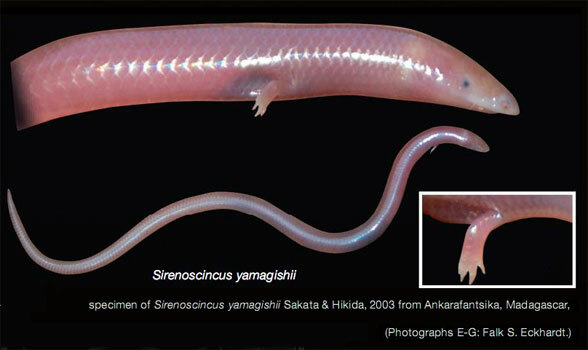 Sirenoscincus-yamagishii, a new skink with forelimbs and no hind limbs. Note the four fingers. with 53 presacral vertebrae and a tail longer than the snout vent length. The snout is pointed and the lower jaw is countersunk, like a shark’s mouth. The forelimbs are tiny with indistinct fingers and four stout claws. An outgroup taxon, Gymnophthalmus, also has tiny fingers and the medial one is a vestige. 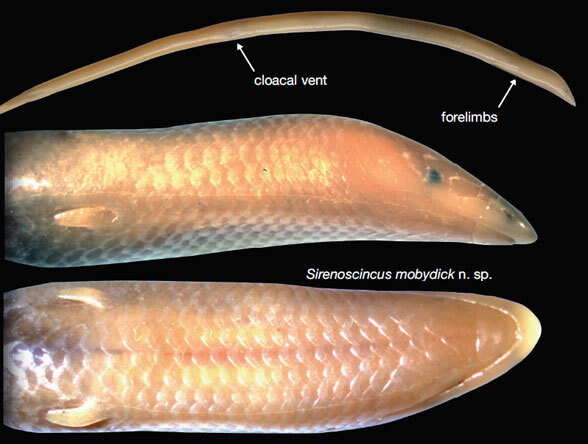 S. mobydick has only five scleral ring bones, the lowest of any lizard. The authors reinterpreted several scale patterns on the holotype species. So, mistakes do happen, even at a professional level. Those mistakes get corrected and no one gets upset (hopefully unlike the blogosphere!). Figure 3. Sireonscincus mobydick, named for its flippers, unique for any terrestrial tetrapod. Colors added. Fossorial skinks are often described by their scale patterns. Unfortunately that doesn’t work with prehistoric skeletons, so I was only able to add only the bone traits of Sirenoscincus mobydick to the large reptile tree (subset shown in Fig. 7). The skeletal traits nested S. mobydick between two skinks Gymnophthalmus and Sineoamphisbaena, another taxon with forelimbs only (granted, the posterior half is not known). Like Sineoamphisbaena, Sirenoscincus prefrontals contact the postfrontals, unlike those of most lizards. In derived taxa the quadrate leans almost horizontally. That’s not the case with Sirenoscincus, which has a vertical but bent quadrate. Figure 4. Sirenoscincus mobydick pectoral and pelvic girdles. Colors (other then the original red) are added here. Miralles et al. (2012) reported, “Due to the absence of molecular data the phylogenetic position of the genus Sirenoscincus is still an enigma, even if we can reasonably claim it belongs to the Malagasy scincine clade.” In the last few days author, A. Miralles reported via email that molecular data have recently nested S. mobydick with skinks. Figure 5. Chalcides guentheri and C. occellatus, two skinks with morphologies quite similar to that of Sirenoscincus. C. oscellatus has longer legs. Note the wrapping of the maxilla over the premaxilla which is continued in Sirenoscincus mobydick which has a smaller orbit. Also note the prefrontal and postfrontal are closer to contact in C. ocellatus. An outgroup taxon is Chalcides (Fig. 5) where you’ll note the same long overlap of the maxilla over the premaxilla. 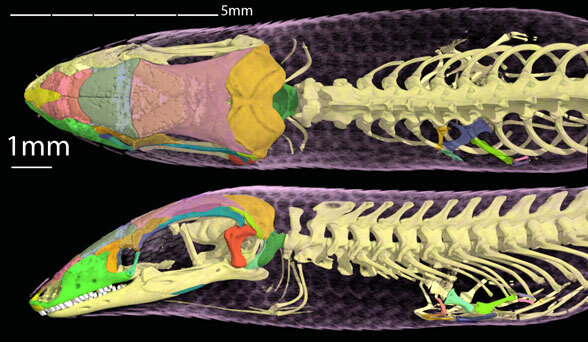 A sister, Sineoamphisbaena also has an underslung mandible, but much more robust forelimbs (only the humerus is known). Could this be a redevelopment? Or has the cladogram missed something, needing more taxa perhaps, to fill this gap? No doubt new taxa will fill these various morphological gaps. Figure 6. Sineoamphisbaena is a sister to Sirenoscincus in which the prefrontal contacts the postfrontal. The lower jaw is countersunk and the upper teeth don’t point down, they point in (medially). New data has revised the relationship of skinks to reptiles in the large reptile tree (Fig. 7). 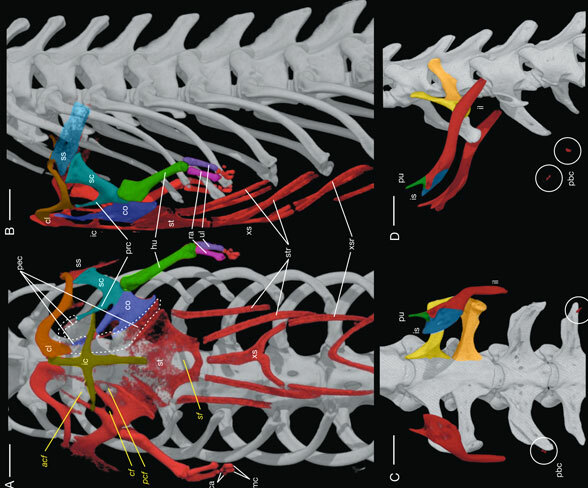 Some to most of the confusion (here or earlier) likely results from the massive convergence in burrowing lizards. And some portion is also due to having good data (old line drawings) replaced by better data (rotating online images), often thanks to the good scientists over at Digimorph.org. Figure 7. Here’s where Sirenoscincus nests in the lizard family tree. Miralles A et al. 2012. Variations on a bauplan: description of a new Malagasy “mermaid skink” with flipper-like forelimbs only (Scincidae, Sirenoscincus Sakata & Hikida, 2003). Zoosystema 34(4):701-719. Sakata S and Hikida T 2003. A fossorial lizard with forelimbs only: description of a new genus and species of Malagasy skink (Reptilia: Squamata: Scincidae). Current Herpetology 22:9-15. This entry was posted in legless, Lepidosauria, lepidosauriformes, lizards, reptile family tree and tagged legless, lepidosaurs, lizards by davidpeters1954. Bookmark the permalink.